A simple way to gain the attention of possible clients outside of your website is by creating a leave behind. A leave behind includes information on who you are and how to connect with you. 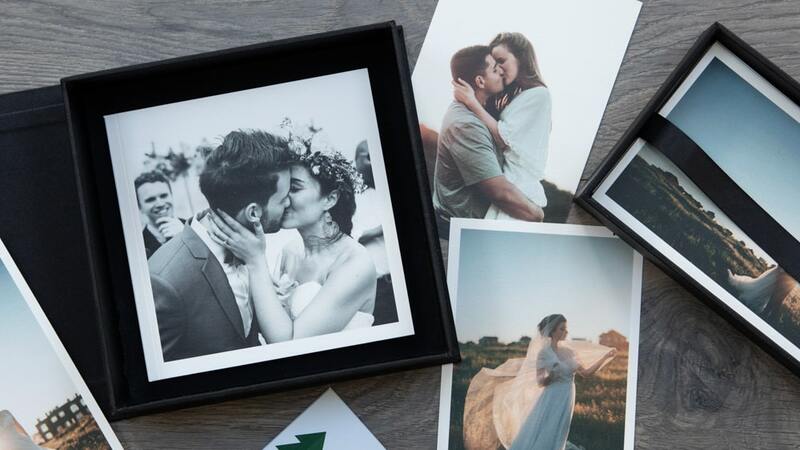 In the world of photography, these are most commonly created to leave at wedding and event venues as well as with wedding planners. Couples tend to choose a planner or the location of their wedding or party before everything else which means relationships with venues or planners could be key to more exposure! In its simplest form, a leave behind can be just a business card. A nice image on the front with your contact info on the back can go a long way but there’s a pretty good chance you aren’t the only one with this idea. Creating something totally unique will help you stand out from the competition! Don’t worry — if you’re completely spent on being creative, we have some ideas for you below! Our favorite leave behind utilizes our Photo + Flash boxes (like the one at the top of the post). The multiple compartments keep items in their place; the most intricate being the Luxe DVD, Print + Flash box (shown below). 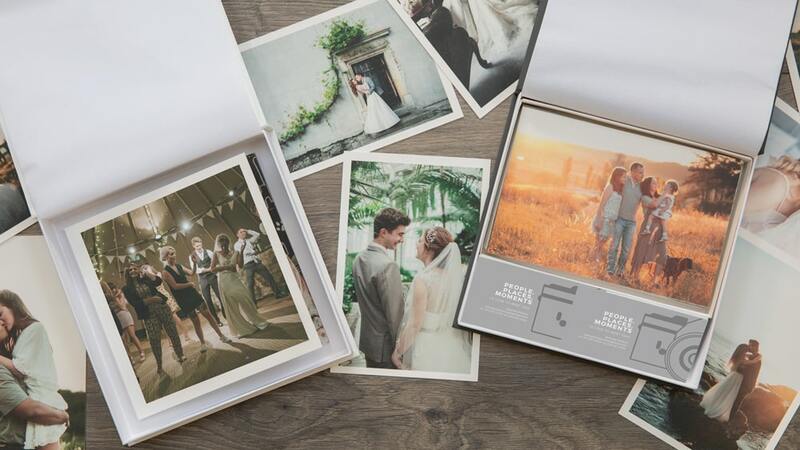 This silk-like box was created to hold up to 100 4×6 photos, a flash drive and a DVD but the possibilities are endless. Instead of a DVD, on the left side consider including nicely printed information about yourself, your pricing, and what they could expect if hiring you. The right side could hold photos from a variety of shoots to showcase your work. A ribbon beneath the photos helps in removing the prints from their compartment easily. The flash drive holder can be removed which leaves the perfect amount of room for business cards. A standard business card and a 2×2 square card or 3 square cards side by side fit this space. We suggest creating a small offer card which prompts the client to let you know where they heard about you. In exchange you can offer a free flash drive, print credit or Playbook, etc. for booking with you. Remove both the flash and photo compartments to leave a wide open space. This space is now perfect for one or several small, square, albums (6×6 or smaller); each showcasing a different wedding or event. 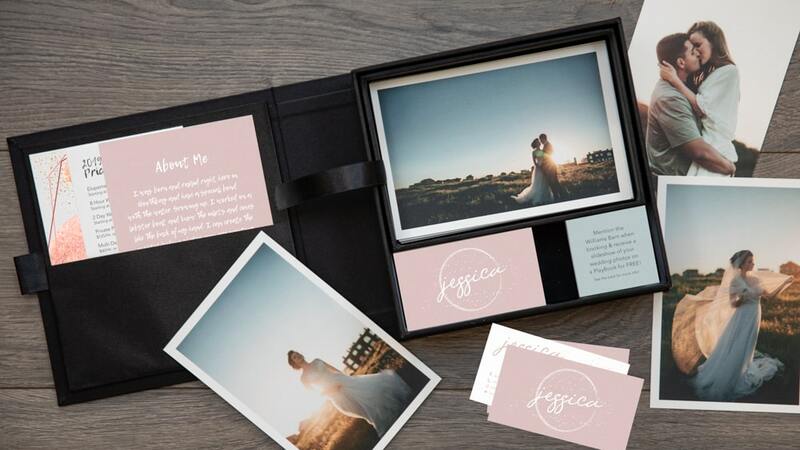 Make this presentation super personal by creating mini albums of events shot at that venue location for inspiration! When you really want to stand out, consider using our PlayBook to talk to potential clients! Yes, this involves you possibly stepping in front of the camera but viewers will be blown away “meeting you”…before actually meeting you! An added bonus is that they would be holding a product they could receive if hiring you. This product alone could get them to book! Plus we all know that video can personalize the consumer experience. Remember that the PlayBook can run for 2 hours on one single charge. A simple phone call (or reminder by way of flowers or cookies) to the venue owner or wedding planner asking them to charge shouldn’t be too much to ask. A nice gift of flowers or a sweet treat is a cheap way to ensure your videos are ready to play each time, too! Feeling inspired? 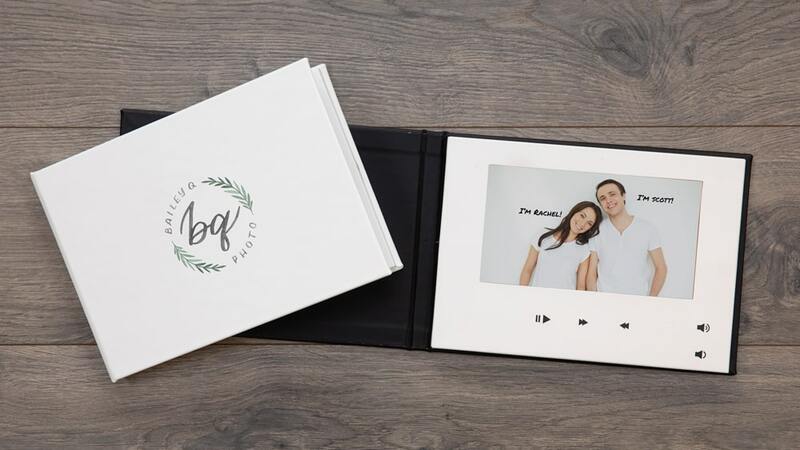 Order your Luxe DVD Print + Flash Box, Photo + Flash Boxes or a PlayBook and save 15%* using the coupon code: LEAVEBEHIND. Additionally, receive 15% off all other Packaging products as well! Are you feeling like you’re ready to start but need help creating your branded print material? Canva is a great, free, tool which allows you to create graphics utilizing their templates. You’ll be able to create business cards and collateral in no time! *15% off coupon valid through February 28, 2018. Valid once per user. Cannot be combined with other offers or used on Outlet or sale items. This entry was posted in How To Use Our Products, Tips & Tricks. Bookmark the permalink.